* Annual estimated passenger usage based on sales of tickets in stated financial year(s) which end or originate at Dockyard from Office of Rail and Road statistics. Methodology may vary year on year. Dockyard railway station is a Great Western Railway suburban station on the Cornish Main Line in Devonport, Plymouth, England. As the name implies it serves Devonport Dockyard. It is also served by trains on the Tamar Valley Line 1.75 miles (3 km) west of Plymouth. 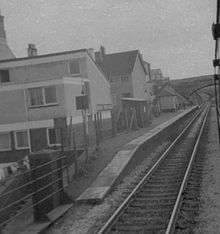 This station was opened by the Great Western Railway on 1 June 1905, one of many halts built to combat the competition from electric trams. The Great Western Railway was nationalised into British Railways from 1 January 1948 which was in turn privatised in the 1990s. Dockyard is served by Tamar Valley Line services from Plymouth to Gunnislake  and also by a few trains on the Cornish Main Line to and from Penzance, some of which continue eastwards beyond Plymouth towards Exeter St Davids. Trains only stop on request – this means that passengers alighting here must tell the conductor that they wish to do so, and those waiting to join must signal clearly to the driver as the train approaches. 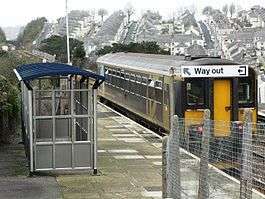 The railway from Plymouth to Gunnislake is designated as a community railway and is supported by marketing provided by the Devon and Cornwall Rail Partnership. The line is promoted under the "Tamar Valley Line" name. It is also part of the Dartmoor Sunday Rover network of integrated bus and rail routes. ↑ Oakley, Mike (2007). Devon Railway Stations. Wimbourne: The Dovecote Press. ISBN 978-1-904349-55-6. Wikimedia Commons has media related to Dockyard railway station.